Mr. Krabs brings submerged supernatural doom down upon the Krusty Krab when he tries to squeeze extra pennies out of a seemingly poor old harmless SEA WITCH! But why does her terrible spell affect everyone but Patrick? Find out in "The Krusty Curse!" Then, in "The House on Jellyfish Fields," cartoonist Graham Annable (Grickle, Box Trolls, Coraline) writes and draws an eerie wordless tale of SpongeBob on the run from the spooky denizens of a mysterious mansion. Plus: a double page cutaway view of a very haunted (and very familiar) pineapple house by Bob Flynn (Bravest Warriors) and Jim Campbell (Over the Garden Wall). 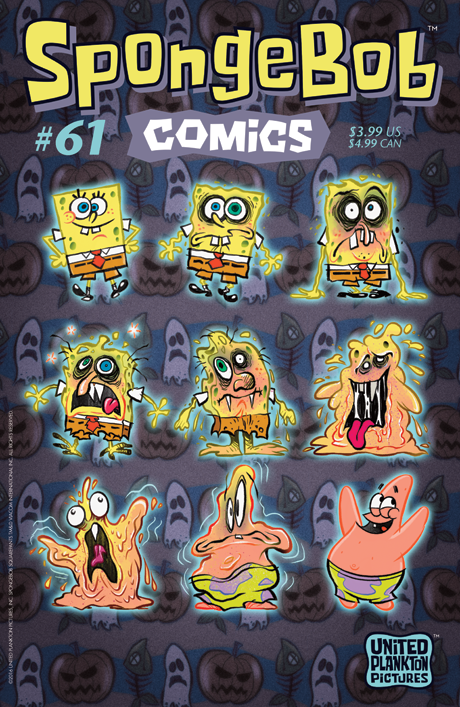 All this plus a feature on "real" ghost ships from folklore and “SpongeFunnies” by James Kochalka!